I spent much of Earth Day focusing on books that promote ecology. Worldchanging: A User's Guide for the 21st Century was the main book I read. 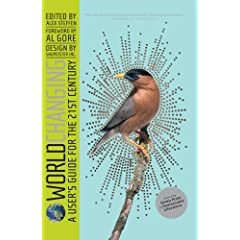 A collection of ideas, resources, and commentary about leading a greener life, the book covers just about every environmental issue in its 600 pages. The relatively short articles make the book a treat to read piecemeal, and any book that helps us stop abusing the planet gets a thumbs up from me. Plus, the diversity of the authors and their fresh approaches to their articles was a welcome relief from more academic environmental titles. My next book is The Secret Lives Of Great Authors.